Falkirk and Hibernian fought out a draw to leave both sides five points behind Championship leaders Rangers. Blair Alston's superbly calm finish looked like it might be enough to earn Falkirk a crucial win. But Jason Cummings' close-range equaliser ensured they remain level on points with their opponents with a game in hand. Cummings should have won it in the closing stages but his powerful shot was brilliantly saved by Danny Rogers. 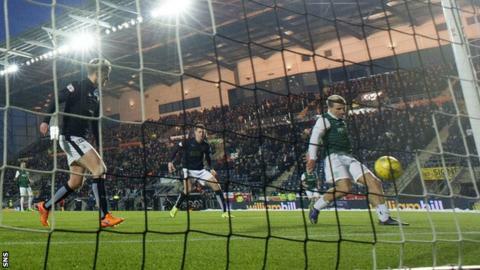 Hibernian applied huge amounts of pressure to the Falkirk goal in the final half-hour, but could not force a winning goal. Falkirk have now gone 12 games unbeaten while Hibs have lost just once in their last 21 matches and both teams again underlined their credentials as credible title challengers. The first half was largely a cagey affair as the teams sparred with each other, but the second period was much more open, largely as a consequence of the early goal, which was beautifully taken. Alston picked up a pass from John Baird inside Hibs' penalty area, deftly side-stepped a despairing challenge from Liam Fontaine before coolly slotting under Mark Oxley. A tactical switch by Alan Stubbs was to prove crucial though. He introduced Liam Henderson from the bench and he was instrumental in turning the tide, as Hibs began to press for an equaliser. They had an excellent claim for a penalty when Luke Leahy seem to foul John McGinn, but John Beaton failed to award the spot-kick. Cummings had already had one shot saved before he eventually hauled Hibs level, as he followed up to score from a yard or so out after Rogers had saved well from Darren McGregor. The visitors looked the likelier winners by this point and McGregor's header was saved on the line as they tried to press home their advantage. It looked as though they would do that with just four minutes remaining as Henderson released Cummings, but the prolific striker watched in dismay as Rogers pushed away his powerful shot. Rangers were perhaps the real winners from this match, as both of their title rivals dropped points, but neither of these sides can be written off in the promotion battle. Match ends, Falkirk 1, Hibernian 1. Second Half ends, Falkirk 1, Hibernian 1. Kevin O'Hara (Falkirk) wins a free kick on the right wing. Attempt missed. Fraser Fyvie (Hibernian) right footed shot from the centre of the box is close, but misses to the left. Conor McGrandles (Falkirk) wins a free kick in the attacking half. Corner, Hibernian. Conceded by Conor McGrandles. Attempt blocked. Darren McGregor (Hibernian) right footed shot from outside the box is blocked. Corner, Hibernian. Conceded by Danny Rogers. Attempt saved. Jason Cummings (Hibernian) right footed shot from the centre of the box is saved in the centre of the goal. Attempt missed. Liam Henderson (Hibernian) right footed shot from outside the box is close, but misses the top left corner. Attempt blocked. Liam Fontaine (Hibernian) right footed shot from the centre of the box is blocked. Attempt saved. Darren McGregor (Hibernian) header from the centre of the box is saved in the centre of the goal. Aaron Muirhead (Falkirk) is shown the yellow card. Substitution, Falkirk. Kevin O'Hara replaces Blair Alston. Attempt missed. Darren McGregor (Hibernian) header from the centre of the box is close, but misses to the right. Blair Alston (Falkirk) is shown the yellow card for a bad foul. Corner, Falkirk. Conceded by Paul Hanlon. Aaron Muirhead (Falkirk) wins a free kick in the defensive half. Substitution, Hibernian. Chris Dagnall replaces Dominique Malonga. Attempt missed. Dominique Malonga (Hibernian) header from the centre of the box is just a bit too high.